pcAmerica’s eCommerce solution brings your store online and helps you sell your products to a wider customer base. The online store will pull product information, pricing and stock levels directly from your Cash Register Express point of sale system. Accurate and robust inventory control is a key component of a retail store’s profit margins and overall success. The inventory tracking capabilities within Cash Register Express™ detail which products are selling, what needs to be reordered and identifies items that have been stolen or are otherwise missing. Good service and quality products are key components of generating new and repeat business, however; those two elements alone will not ensure success. Our retail point of sale solution helps you answer the question of ‘What next?’ after selling to a customer. 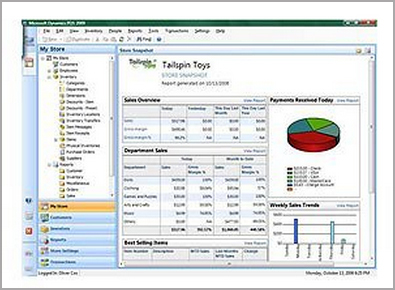 Microsoft Dynamics POS 2009 features an intuitive and highly customizable user interface that gives all employees, from the storefront to the back office, access to critical information such as inventory levels and purchase history. The interface is optimized for touch screens and can be tailored for specific roles or individuals, increasing productivity and reducing costs associated with training times. In addition, retailers have the ability to create custom buttons for completing common tasks, adding efficiency to each transaction. Microsoft Dynamics POS 2009 provides your employees with a familiar Microsoft software experience. Because your employees get up to speed quickly, they can concentrate on excellent customer service. You get improved employee productivity with a role based user experience that provides employees with the information to make better decisions and to help lower costs. Microsoft Dynamics POS 2009 helps you improve retail store operations from the point of sale to your supply chain relationships. Microsoft Dynamics POS 2009 works with your existing Microsoft business products to enhance information-sharing, and scales to meet future needs. And because it's familiar, easy to use, and fits with existing systems and Microsoft technologies, you can reduce IT costs, maximizing your IT investment. 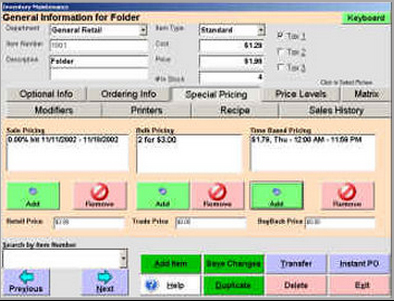 Microsoft Dynamics POS 2009 automates processes and adapts to your specific retail business. Your employees are free to be more productive and focus on customers. And you can enhance customer loyalty by providing unique shopping experiences, including multichannel retailing, mobility, and flexible payment options. Your business changes quickly. With Microsoft Dynamics POS 2009, you can respond quickly with the insight you and your employees need to make decisions confidently. And with greater visibility into inventory management, trends, and employee productivity, you can maximize business success. Whether your business is one or two stores or a retail chain, Microsoft Dynamics POS 2009 helps you integrate store operations, business information, and processes. Microsoft Dynamics POS 2009 works smoothly with other Microsoft business products you already use for improved information sharing and reduced total cost of ownership (TCO). Work easily from within your business management solution with familiar Microsoft Office applications, including Microsoft Office Excel, Word, and Outlook for efficient data analysis and communications. Maximize the potential of other Microsoft technologies such as Microsoft SQL Server, Microsoft SQL Server Express, the Windows operating system, and Windows SharePoint Services to manage data more effectively, enhance reporting and analytics capabilities, facilitate collaboration, and strengthen security. Integrate easily with other ERP or financial management software, including Microsoft Dynamics AX, Microsoft Dynamics NAV, and Microsoft Dynamics GP. Take advantage of industry-standard technologies—including XML, FTP, HTTP, OPOS (OLE for Retail Point of Sale), and Microsoft POS for .NET—so you can connect easily to other third-party, line-of-business software and devices and increase information sharing across your business.